Fellowes Monitor Riser helps reduce shoulder, neck, and eye strain by positioning monitor or laptop at a comfortable viewing angle. The adjustable feet optimize monitor height positioning up to 2 ½” for a total height between 4” and 6 ½”, while the platform features 3-way height and tilt adjustment for laptops. 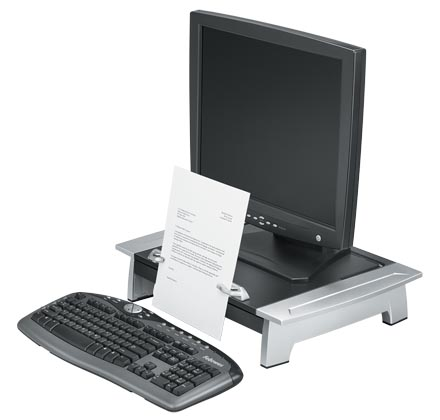 Also features an in-line copyholder so you can position documents for easy, comfortable viewing. Stow laptop underneath monitor riser for space-saving storage. Includes storage drawer to organize supplies. Supports monitors up to 80 lbs. or laptops up to 10 lbs.